1. Our protevtive case is made of high quality TPU material, strong but soft, durable with delicate detail, protect your watch face and screen from scratch or broken. 2. 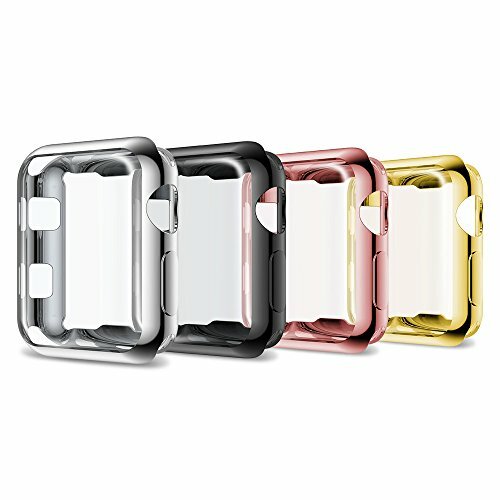 The protective case cover the watch screen and metal rim, provides good protection in daily use. With delicate cutouts on button positions, it is easy access to all the controls and features. 3. Multi colors design on top surface and rim, presents elegant and simple look. The clear top surface provide you great touch feel and the color rim matches your watch perfectly. 4.The stylish design shows a unique temperament. Let you bid farewell to dullness and enjoy the good mood that special accessories bring to you. High-quality materials: Made of premium TPU material, the shell is treated with high gloss, crystal clear, strong but soft, flexible and can protect your watch face and screen from scratch or broken. Full protection design: The protective shell covers the watch screen and metal rim,360°providing good protection in daily use. All controls and features are easily accessible through fine-cutting at the button's location. Fashionable look:The top HD transparent surface and edges are designed in a variety of colors, with an ultra-thin design that presents an elegant and simple appearance. The clear top surface provides you with excellent tactile sensation, fine optical texture, sensitive use, and perfect matching of color edges with your watch.Improve your charm. Compatible Models: This TPU housing is for Apple Watch Series 3 and Series 2, but please note that it does not apply to Series 1.